The Espresso II is a compact and powerful desktop ID card printer, that is a brainchild of Italian design & engineering and reflects German reliability in consistent performance. It offers its users great value and versatility with superior print speed and outstanding print quality. With its robust and durable construction, the Espresso II looks and works great in any office or card production environment.. The new printer line works perfectly for a wide variety of applications such as Employee and Membership ID Badges, Service and Benefits Cards, Gift and Loyalty Cards, Access Control Cards, Student IDs, and Transit Cards, just to name a few. The Espresso II is a neat and robust unit, an exceptionally good-looking design enhances the look and feel of any office environment. 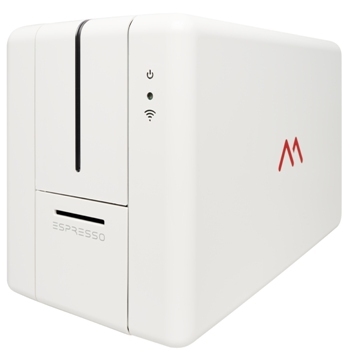 The Espresso II is available as a single, or dual-sided, configuration with or without Card Encoders. With a small footprint, same-side input/output hopper, its minimum size was designed for maximum flexibility. And with upgradeable functionality and security. Matica Espresso II Direct-to-Card Printer/Encoders comes with a global 2 years warranty. Unicard will support all your Matica Espresso II spare parts and servicing.